It only took me six months to get around to it. That's because all the websites I visited to learn about how to do it equated the danger level of melting beeswax to cooking meth. So yesterday while my husband was out of town I figured if I burned the place down I'd be the only one here. It's a pretty simple process. In this pic you can see the honeycomb as it is after the bees clean it up (after I process the honey I put the comb back out near the hive and the bees collect all the honey I missed and take it into the hive to store for winter) during harvesting season. I've crumbled some to help it melt faster. The pot was full when I started. It took about 30 minutes over low heat for me to melt it down. When completely melted the pot was about 1/4 full. There are a few dead bees and some debris mixed in so after it's melted you strain it through cheesecloth. 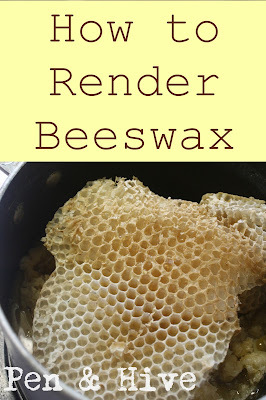 Make sure to use something you only intend to use for beeswax after this. It will be impossible to clean. Collect your containers to pour the strained wax into. I heated the bowl I was going to use for straining in the oven first, to keep the wax from hardening so quickly. Once you've strained it, remove the cheesecloth, and pour it ASAP into the containers. Even though I heated the bowl you can see how much had hardened in the ten seconds it was in there. I threw the used cheesecloth into the pot while it was still on the burner to mop up the excess wax. I'll use this for a firestarter in the fireplace. I thought it was kind of funny that the imprint on the wax discs was the recycling symbol from the bottom of the containers. This is my favorite recycling project ever.